This Green Bean Casserole Cheesy Bread puts a creative spin on the classic holiday side dish. 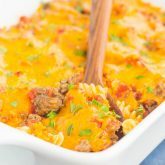 The zesty casserole is made in just one pan, piled on top of toasted cheesy bread, and then baked until warm and bubbly. This simple dish is fast, fresh, flavorful and will become the hit of the dinner table! T-minus 6 days until Thanksgiving. If you’re anything like me, you’re in disbelief that we’re just about to start the holiday season. I mean, seriously…where does the time go? I swear it was just last Thanksgiving, and now, here we are, nearing the end of 2016. Ok, enough of that stuff. Let’s get to talking about turkey day! What are your plans for the holiday? Do you host Thanksgiving? Or do you visit family or friends? Or maybe something entirely different? The hubster and I split our time between both sides of our family. So, this year, we are going to my in-laws for dinner, and then we’ll end up at my parents’ house for dessert. Lots of food, lots of laughs, and lots of fun. And call us crazy, but the hubster and I usually stop at the mall on the way home from our turkey dinner, just to walk around and “break-in” the holiday season. I’m not one of those stand-in-line-at-6pm-on-Thanksigivng type of people, or even a Black Friday shopper, as the crowds aggravate me. I would much rather do my Christmas shopping during the day, in the middle of the week, or even better…online! But, it’s just fun to walk around the mall at 10pm at night, just to see all those crazy people that endure the crowds and lines for the best deals. But, let’s back up to the food. After all, that’s what Thanksgiving is focused on, besides friends, family, and being thankful, of course! My all-time favorite Thanksgiving side dish is the classic green bean casserole. I love the texture, the taste, and the memories that are associated with this food. Since I usually only have this dish on turkey day, I savor every last bite. And keep coming back for more! 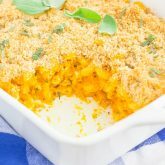 But, this year, I thought I would get a little more creative with my favorite casserole and put a unique spin on it. Since I’m a food blogger, I feel like it’s my duty to do so. And I think you’d agree, right? When I was shopping at Target last week for my Thanksgiving essentials, I immediately reached for those staple ingredients for the green bean casserole. 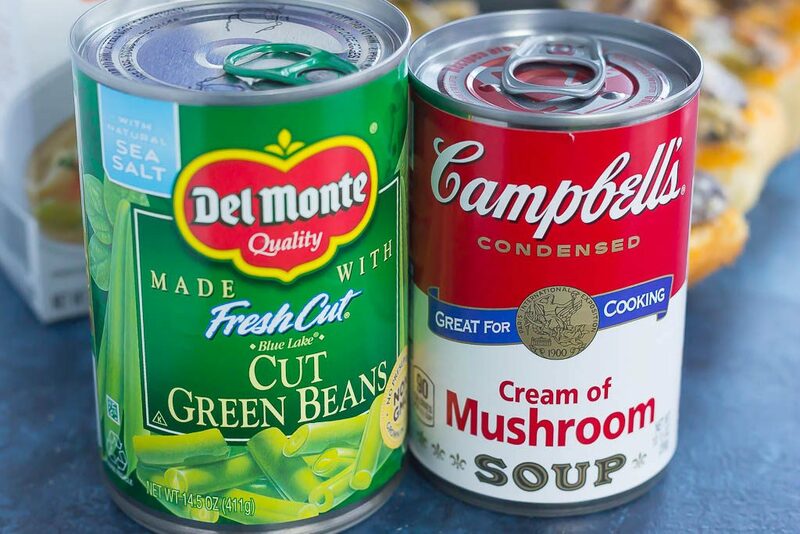 And you can’t have a green bean casserole without Campbell’s® Cream of Mushroom Soup. It’s a traditional family favorite and it’s quick an easy option for mealltime that will please even the pickiest of eaters. Campbell’s® Cream of Mushroom Soup is also perfect for adding your own unique twist and favorite garnishes for those special dishes. 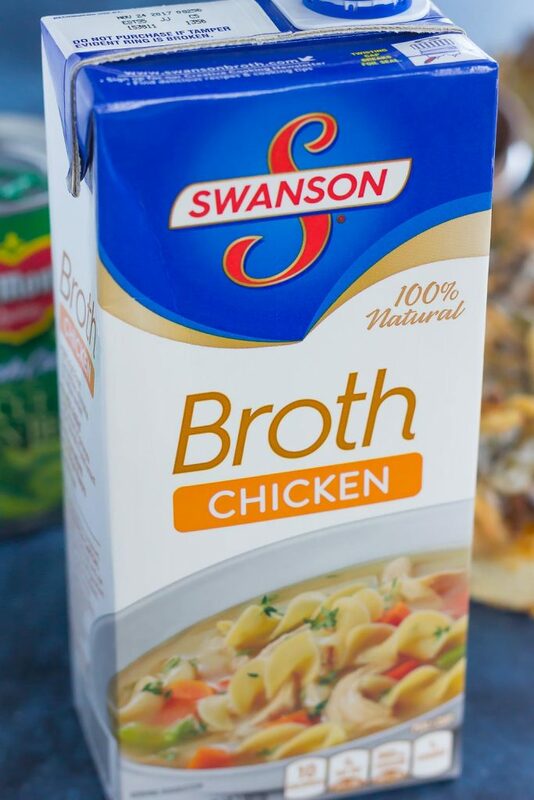 After stocking up on several cans of Campbell’s® Cream of Mushroom Soup, I picked up some Swanson® Chicken Broth. It’s 100% natural and made from simple ingredients, with no added MSG, artificial flavors, or preservatives. And last, but certainly not least, I picked up some Del Monte® Blue Lake® Cut Green Beans. Made with just green beans, water, and a dash of sea salt, I knew that these would be the veggie of choice. Ans since they’re high quality and delicious, these green beans will be the star of the holiday table. After all, no one will be able to guess that these are canned green beans! After gathering the rest of my holiday essentials at Target, I headed home to whip up a unique dish for Thanksgiving. 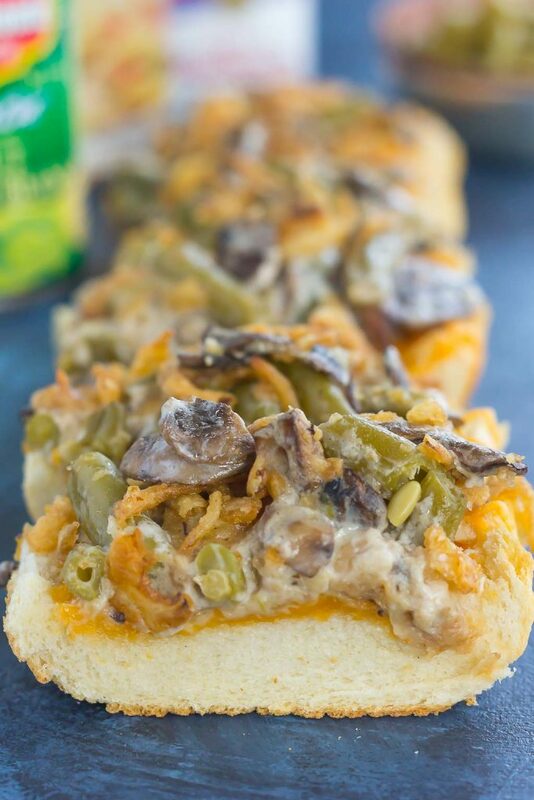 Green bean casserole and cheesy bread…what could be better? I know this combination might sound a bit odd, but trust me, it’s sooo delicious! 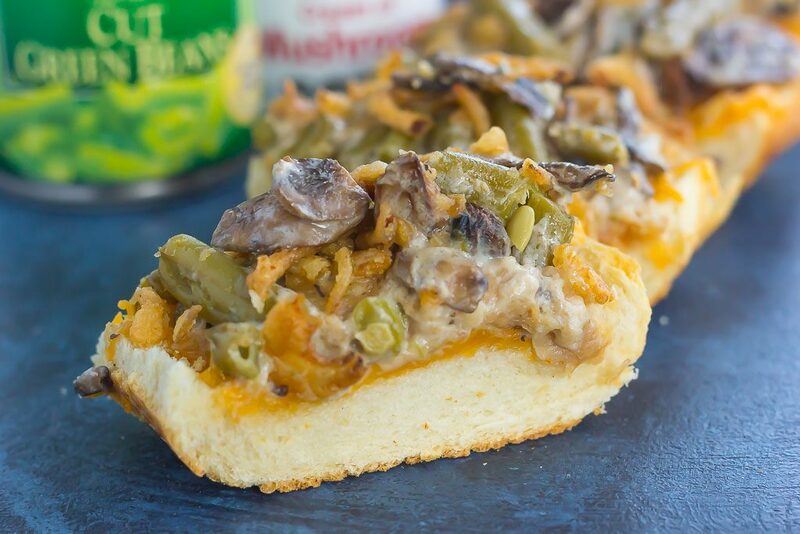 The bread is crunchy, the cheesy is melty, and the green bean casserole is bursting with flavor. Slice the bread and watch those hungry dinner guests be amazed. And like most of my recipes, this Green Bean Casserole Cheesy Bread is so easy to make! To start, you’ll slice a loaf of Italian bread in half, drizzle with olive oil, and broil until it starts to turn golden. Then, you’ll saute some fresh mushrooms and garlic. Next, it’s time to add in the Swanson® Chicken Broth and let it simmer. Add in the Campbell’s® Cream of Mushroom Soup and Del Monte® Blue Lake® Cut Green Beans. Spoon the mixture on top of the toasted bread covered with cheddar cheese, and then bake until warm and bubbly. Easy peasy, right? 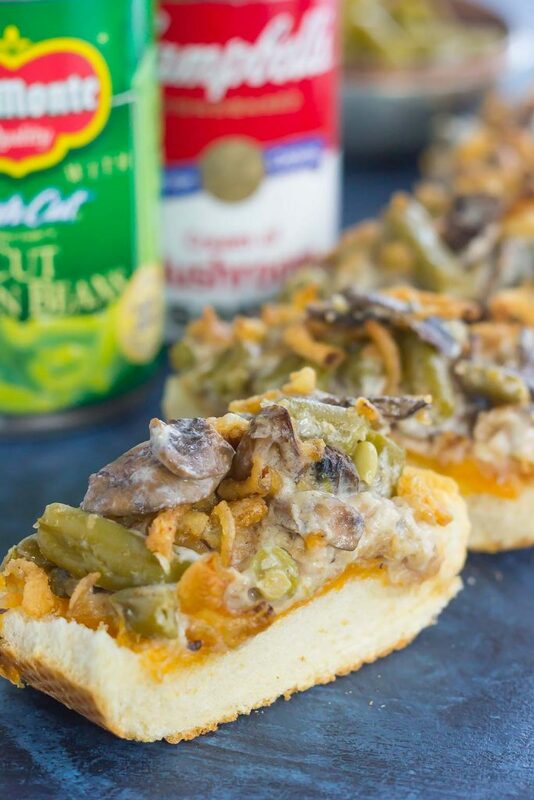 One bite of this Green Bean Casserole Cheesy Bread and you’ll fall in love with the classic taste, gooey cheese, and crunchy bread. This dish will quickly become the star of your Thanksgiving table. So grab those ingredients and whip up this tasty bread today! Preheat oven to medium broil. Cut bread in half lengthwise. Drizzle one tablespoon of olive oil over each half. Broil until the bread starts to turn golden, about 2-3 minutes. Remove from oven and set aside. Add mushrooms, salt, and pepper. Cook until mushrooms start to brown, about 4-5 minutes. Add Swanson® Chicken Broth to skillet and simmer for 3 minutes. Add Campbell's® Cream of Mushroom Soup and stir until thoroughly combined. Remove skillet from heat. 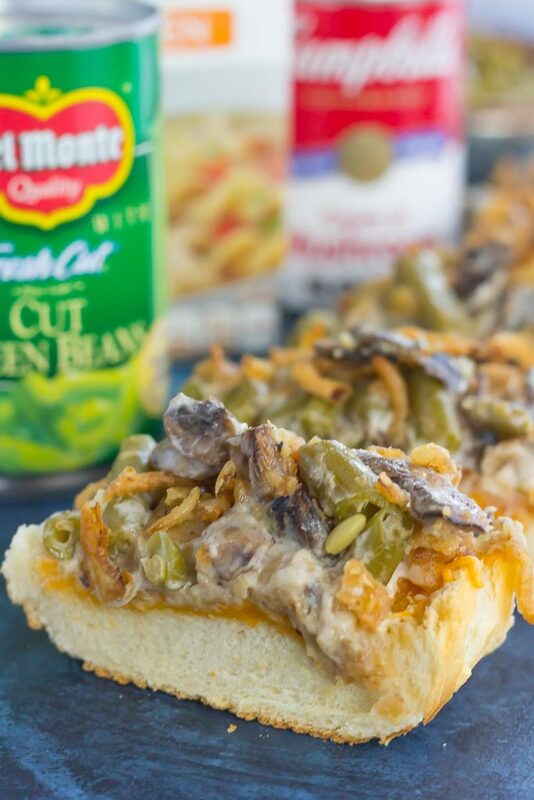 Add Del Monte® Blue Lake® Cut Green Beans and French's Crispy Onions. Stir to combine. Sprinkle 1 cup of shredded cheese onto each slice of bread. Spoon green bean mixture evenly over each half. Top with additional French's Crispy Onions. Bake for 13-15 minutes, or until cheese starts to melt. Like what you see? Then head over to Target to stock up on all of your Thanksgiving essentials. 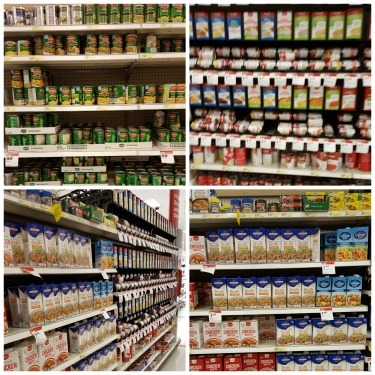 You can also check out the Campbell’s® Cream of Chicken Cartwheel Offer, Campbell’s® Cream of Mushroom Cartwheel Offer, Swanson® Broth Can Cartwheel Offer, Swanson® Broth Carton Cartwheel Offer, and Del Monte® Cartwheel Offer. You can also connect with Campbell’s® on Facebook, Twitter, Instagram, Pinterest, and YouTube. Del Monte® fans can find them on Facebook, Twitter, Pinterest, and Instagram. You can also head over to this site to see more recipes from Swanson®. I can't believe that you go to the mall on Thanksgiving night -- you're braver than I am! I've seen the crowds and it scares me. :) This bread sounds like the delicious combination of two favorite holiday sides. YUM! The mall isn't actually too bad on Thanksgiving night, otherwise I wouldn't step foot in it! :) We usually have no problem finding a parking spot and just like to walk off our turkey dinner! :) Thanks for the cheesy bread love, Blair! I'm jealous that you're done with shopping, Kate! I wish I was like that! :) Thanks for the green bean love! Love anything with cheese and this is so creative! I always do online shopping on Black Friday, but we also go to the mall! Not sure if I'm going this year, since we are travelling :) Pinning! Thank you, Mira! And yay for online shopping...it's the BEST! I don't really do the Black Friday shopping thing - I'm more of a Cyber Monday shopper from my couch :) even braving the parking lots sounds like a lot! But I'm loving this cheesy bread - anything piled on crispy french bread is absolutely delicious. This looks so good, Gayle! I hate shopping during the holiday season too, but on a Thursday night it's not too bad! :) Thanks for the kind words, Rachel! It's so funny to crowd watch then! But I'm sure it's nowhere near has bad as it is on Black Friday! :) Thanks for the kind words, David! The hubs and I have lined up for a TV a few years ago on Black Friday but I would much rather shop online as well. Love all the yumminess you piled on this cheesy bread, Gayle! 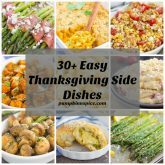 This is such a creative twist and perfect for Thanksgiving! Thank you for the cheesy bread love, Kelly! Bread: Thanksgiving must have. Green bean casserole: Thanksgiving MUST have! The combination of the two blows my mind! Yes, I must try this! Haha thanks, Annie! It looks weird, but it's SO good! I'm in disbelief that its almost Thanksgiving but I am ready for it! I always dip my rolls in my green bean casserole so this just makes sense to me. 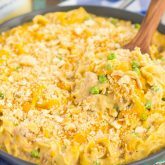 There's no going wrong with delicious carbs, green bean casserole and plenty of cheese -- this is such a great idea! Thank you, Marcie! I agree, carbs and green bean casserole are a must have! We had our Thanksgiving last month, but I do love Thanksgiving!! Green bean casserole is not really a popular side here, but I love green beans and am actually having them with dinner today! I love your twist here and it's such a perfect little app. And I love those crispy onions! :) Pinned, of course. I'm not one for huge crowds at the mall, but if I'm just going to browse like yourself, I don't mind. Perhaps a coffee in hand and just stroll along ;) And, of course, check out the Christmas decorations! I missed this one last week as I was away, but better late than never :) ! I love green beans too. That, and asparagus, is my vegetable of choice for dinner! :) Thanks for the sweet comment, friend! Thanks so much for the kind words, friend! I'm staying as far away from the mall that I can on the weekends, I've gone during the week, and that's enough for me! :) Hope you have a wonderful weekend, too!